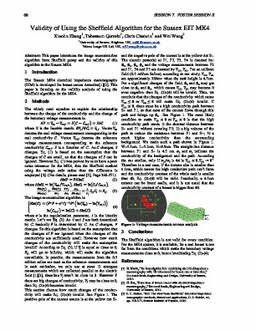 This paper introduces the image reconstruction algorithm from Sheffield group and the validity of this algorithm to the Sussex MK4. Zhang, Xiaolin, Qureshi, Tabassum, Chatwin, Chris, & Wang, Wei. (2014). Validity of Using the Sheffield Algorithm for the Sussex EIT MK4. In 15th International Conference on Biomedical Applications of Electrical Impedance Tomography (EIT 2014). International Steering Committee on Electrical Impedance Tomography.